Tigran Petrosian is a titan of chess history. All agree he was a genius of strategy, defence and sacrifice, but didn�t he take too many draws? Possibly so, but when Petrosian selected and annotated his best games, that flaw disappeared, leaving only brilliance and profound chess understanding. As Garry Kasparov said: �My games with the 9th World Champion broadened my understanding of chess. Had it not been for these two defeats, I would possibly not have reached the top in chess." This book is an English translation of a Russian classic that is a favourite of many grandmasters, including Mihail Marin and Levon Aronian. 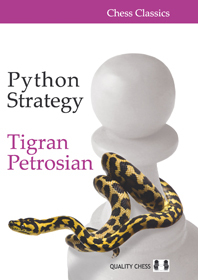 A literal translation of the Russian title might be �The Strategy of Soundness� but Python Strategy is a better fit for Petrosian�s more ambitious games. As another World Champion, Max Euwe, once wrote: �Petrosian is not a tiger that pounces on its prey, but rather a python that smothers its victim." Tigran Petrosian was World Champion from 1963 to 1969, as well as a superb team player for the Soviet Union. In Olympiads he won nine team gold medals and six individual gold medals, winning 78 games, drawing 50 and losing just once.